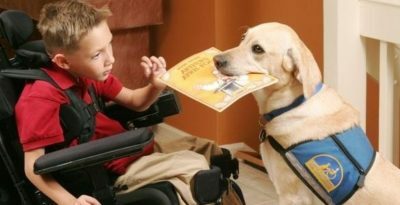 Dogs are considered as the most trustworthy animal and for that Benjamin Franklin has said: “There are three faithful friends: an old wife, an old dog, and ready money.”As people trust this animal so, dogs are trained to help the disabled people, and these dogs are called service dogs. Isn’t it amazing that a dog will always be there to direct people with visual impairment? Find out the potential of the dog: First of all, you need to know whether the dog is at his right age or not. Training should be started in the exact age so that the blend of intelligence and attention can be there in the dog. 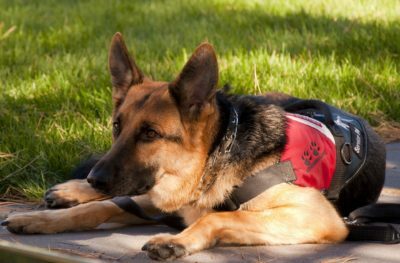 To meet the requirements of a service dog, it is very needed that the dog is safe regarding health. You will have to put considerable effort, and a long time on your dog, so it becomes necessary to know about the health of the dog. One of the most significant activities for keeping a check on your dog is taking him to the vet twice in a year. Know whether the dog is intelligent and eager to please. You should notice the attitude of the dog as it should be confident as it is needed for the job. Then, analyze how much training should be given to the dog. Make sure that the dog you are training is not over protective for these kinds of dogs can’t become a good match for such training. Training for the dogs: When starting to train, make sure that the dog you have chosen is neutered and if it is not done, neuter or spay your dog. Although neutered dogs are less aggressive, it is a needed task for these kind of dogs, as female dogs are not able to work in heat and males are easily distracted by being territorial. Then, start teaching your dog the necessary skills of the training. Once the basic training is done, switch to the clicker training for your dog, it is quite useful. Then comes the time to train your dog to behave properly. Teach the dog not to greet anybody else but only you. It is very necessary to make the dog aware about its duty time. Train him when he is off duty, keep it on focus that your dog knows when he is off duty and how to behave at that point. Some specialized skills are also needed in these dogs so teach them that too. To teach the specialized skills, you need to go with small steps like when you teach them to fetch keys. First, you have to train the dog to recognize the keys, then picking them up after that bringing them to you, and giving the keys. Train the dog with public access like urinating and defecating on your command only, never showing anger in public and much more. Now comes the time to certify your dog. There are legal ways for service dog registration. Go through this process and get your dog registered as well as certified. If you think that you have a dog who is capable of such tasks, then you should begin to train them and go for service dog registration. As we all trust the dog at our home, it is better to train our dogs for the help of aged persons at home. They learn very quickly, and it is not tough to train them the way we want them to behave. After a few training sessions, they start understanding the command we give them, and they act as per that. If you have any plans like this then go for it now and start training your dog the way you want him to behave or act! And if you’re looking for a great resource on how to get a service dog, make sure to head over to WileyPup as they have a great infographic on the topic.